Enjoying a meal with loved ones is a cultural pastime and rite of passage every nation and group of people the world over cherish and enjoy. Weddings and anniversaries, birthdays, graduations, holidays, and many other celebratory events are encapsulated and culminated over the breaking of bread with family and friends. Although in America it is considered culturally acceptable and even ‘normal’ to dine in a public restaurant setting, there are many other ways to enjoy your event other than being in a noisy, hectic and in many ways, generic environment to do so. When you can have the menu made just for you, in the comfort and privacy of your home or anywhere else there is a kitchen space? Well, the answer is that you don’t have to, by allowing our expert culinary staff to provide customized personal chef and event catering services for you and yours! A Magic Touch does not just believe in pampering the outside of your body. Rather, we also understand that your insides deserve to be pampered too! That is why we offer professional and gourmet personal chef and event catering service both by itself, as well as in combination with our other mobile therapy and treatment services. 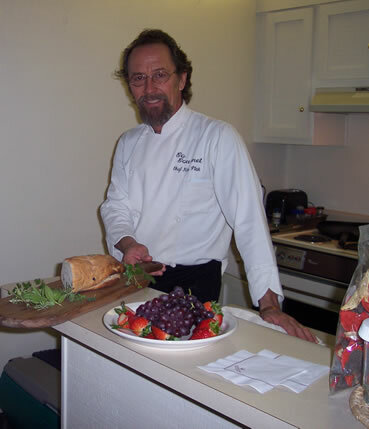 Personal Chef 2 Our expert culinary staff includes 3 licensed and accredited personal chefs, all of whom received extensive training at an accredited culinary school. Their experience, culinary proficiency and acute attention to detail brings an elegant touch to every event or occasion. 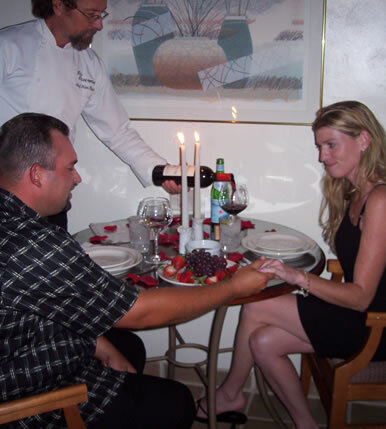 From a romantic 4-course candlelight meal for two for a catered spa party, refreshments during a corporate spa event. Any occasion with access to a kitchen, our personal chef services will make your day or night a momentous one you and your guest(s) can remember forever. Your personal chef will meet you with and complete a preliminary consultation, in order to provide you with gourmet food items that are perfectly planned to match your tastes and event. Our personal chef and event catering service includes set up, cooking, serving, and clean up—with many extraordinary details attended to as well, like centerpieces and candlelight where appropriate. In addition, we can even organize and facilitate live music—be it a violinist, DJ or an entire ensemble. Just think about the possibilities, and the opportunity to make a one-of-a-kind impact, impression and most of all create an unforgettable experience no matter the occasion. Please contact us to inquire about rates and availability of our personal chef and event catering services, either by themselves or added to any other therapy or treatment services. Advanced planning of 7 days or more is preferred, but please call to see if your event can be scheduled with less notice.